No confusing buttons. User friendly Graphical User Interface. Poweful programming capability. Advanced, flexible scheduler. Powerful enough for commercial yet simple for residential applications. Control and access from anywhere. No app to install. Use from any computing device with a browser. User friendly, intuitive Graphical User Interface with Google Map. Automatic delay after rain (rain sensor required). Supports rain sensor, flow sensor, door sensor. Can be scheduled to automatically close garage door. Run time can be minutes or seconds. Master valve can be configured per program or zone. Can turn on multiple valves simultaneously. Calendar view to show weekly schedules. Detailed system logs. History report with water usage. Easy one click firmware update. Input: 24V AC 1A transformer (included). Ethernet (with Ethernet/USB option model). Cellular modem (with Ethernet/USB option model). Extends up to 64 zones. Operating system: any OS with HTML5 browser. Our support team will answer all e-mails within 24 hours after received. Does BlueSpray require (wireless) internet access? The short answer is no. BlueSpray can work in "Stand alone" mode without internet. 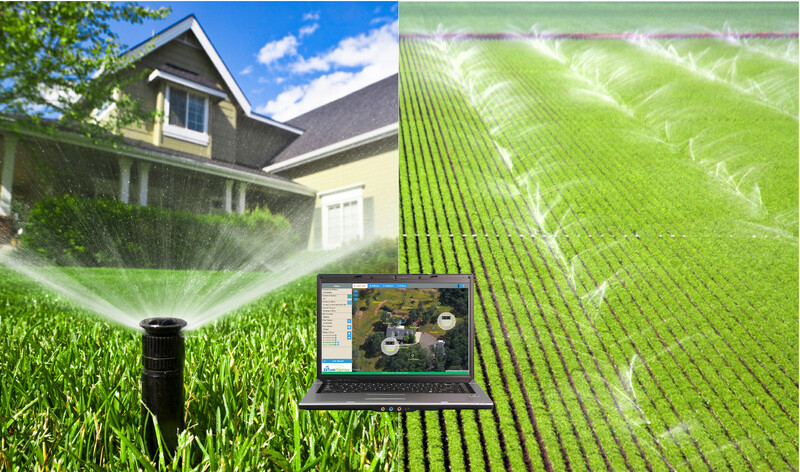 In this mode, you can access BlueSpray with your computer, tablet or phone to configure, change or monitor it. Once set, BlueSpray can run on its own. However with internet access, you can enjoy all the great features that BlueSpray offers. Which browsers does BlueSpray support? BlueSpray supports all major browsers. For best results, we recommend Firefox, Chrome, Safari and Internet Explorer verion 9 or later. Also, if you use Internet Explorer, please make sure that the browser is set to use Document mode 9 or later. Note: For Surface tablet, drag and drop does not work on touch screen. Please use other browsers or mousepad for best result. How do I access BlueSpray controller from the internet? Register your controller, log onto your account from the "Account" tab on our web page and access your controller from anywhere. I got new router/I changed router password. How do I tell the controller of the new WiFi password? Does BlueSpray require cloud services? No. Other web-enabled controllers run in the cloud, which requires monthly fees, and if the cloud goes away, the controller is useless. 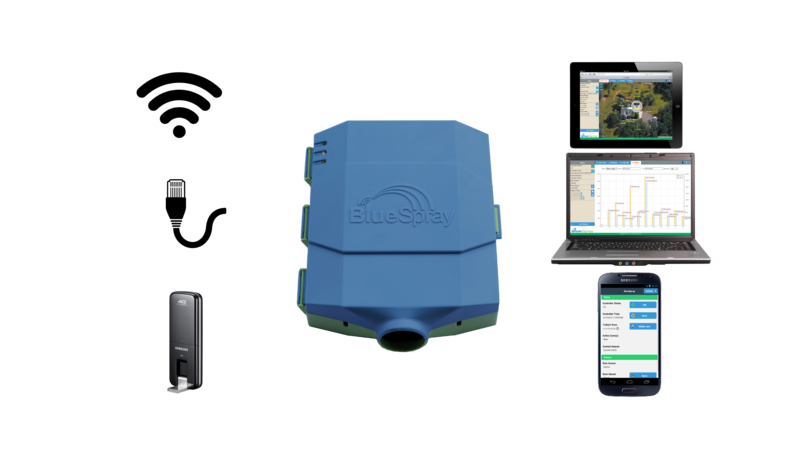 BlueSpray can run completely on its own without the cloud, without monthly fees. Does BlueSpray send data encrypted? You can access the controller in either HTTP or HTTPS protocol. In HTTPS, the data is sent encrypted (SSL). NOTE: When access your controller from the internet, it is best to use HTTPS protocol to protect your data. How can I prevent my neighbor (or anyone else) access my BlueSpray controller? We use NOAA weather forecast. One hour before a scheduled run, the controller checks for the forecast weather. If any weather condition meets or exceeds the configured threshold at the start of the run, that run is cancelled. For the rain forecast, you can configure the controller to look for up to 24 hours ahead. Why aren't there any buttons on BlueSpray controller? 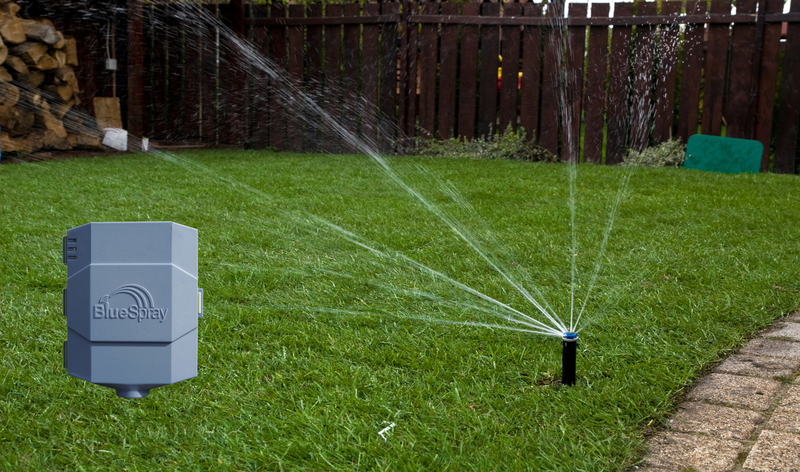 We design BlueSpray to keep you out of the garage or not having to stand in the rain to turn the sprinklers off. You can do everything with the controller without being in front of it. How can an irrigation technician turn on/off my BlueSpray controller? BlueSpray has a "Discovery" mode. When you schedule a technician to come out and service your system, just slide the reset switch to the down position. BlueSpray will enter Discovery mode in 30 seconds after the switch is down. 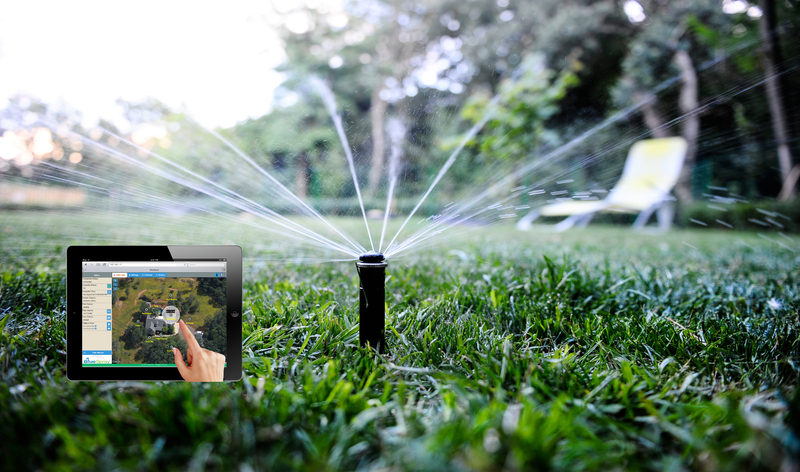 The technician can access BlueSpray via "bluespray" hotspot, IP adrress 192.168.123.1 with a phone or tablet. After servicing, he can just slide the reset switch back. It is hard to believe that a person conducting business doesn't have a smart phone nowadays. But even if he doesn't, you can control your system from work, or vacation. Consider the advantage of having a BlueSpray controller: you don't have to let anyone into your garage. Can I use another lawn picture for my UI? Yes, you can. 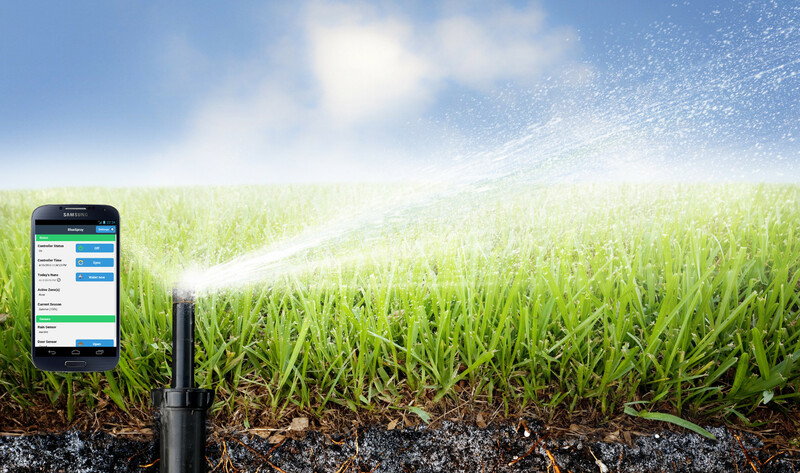 You can use one of many pictures from our lawn collection or any picture of your property that you wish. Or you can use Google Earth satellite picture of your property. The picture must be in the 4:3 aspect ratio, at least 800x600 pixels. You must host it from a web site on the internet, then enter the full URL of the picture. There ae many web sites which you can host your pictures for free, including Facebook, Google, photobucket, tumblr, etc. What do the lights on the side of the controller indicate? The green light on the top is power on status. The blue in the middle is data i.e. when there is data in the wireless packet. The amber light is warning. If solid, the controller is booting. When flashing, the controller needs attention, mainly because it cannot get the system time. In normal operation, it should be off. Is there any API access from other (home automation) software? Yes. Our API is simple to use, all HTTP POST based. You can access/control the controller entirly via our API. In fact, our UI is built on it. For more information, please contact our support team.